A diet only works if you stick to it, a training plan only works if you follow it through. Willpower only lasts a certain amount of time. Therefore adopting lifestyle habits is the true key to long term success. Nutrition is number one but exercise will increase your body composition and get you closer to your goals. 1. Use exercise to increase energy levels, rather than saying I am too tired after work. 2. Use exercise to de-stress rather than drinking a glass of wine in the evening. 3. Use exercise to lift your mood, rather than feeling sad and eating a tub of ben and jerrys. 4. Use exercise to meet people, to get out and socialise, rather than heading down the pub. So often we eat subconsciously or we use eating as a distraction, something to do and as a procrastination. Make it as hard as possible to deviate from healthy eating. Writing down everything you eat and drink you become more honest with your eating habits. We are also all guilty of underestimating how many calories we consume, therefore food journals gives you raw data that allow you to identify weak spots in your diet and plan solutions to improve them. 2. Chewing helps – people who spend time chewing their food, are firstly more mindful of what they are eating, but also produce more satiety hormones so become more satisfied and eat less. Skipping meals seems like it would work in your advantage as you would generally eat fewer calories, but studies have shown this is not the case. Skipping meals has a detrimental effect on energy metabolism, and because hunger and stress hormones get out of balance, it later stimulates greater food intake. For example, MRI scans have revealed that when people skip meals there is a higher activity in the reward pathways of the brain when shown pictures of high calorie foods. There is an exception to this and that is planned and executed Intermittent fasting. The difference being eating and calories intake are consistent. Vegetables are filling due to their high fibre content and contain lots of nutrients whilst being low in calories. Protein is very satiating and it costs the body more to digest than carbs and fat do. Whole foods have a higher thermic effect than processed foods, burning more calories to digest them, just like protein. 6. Use the first bite rules. The ‘first bite rule’ states that whichever food you choose to put in your mouth first you will tend to eat more of that food at that meal. For example, if you started with a bread roll, or chips, you would then go on to consume more high carb foods at that meal. Whereas if you chose to eat the vegetables first, you are then more likely to consume more veg and less of the chips and bread. Use this rule as a habit with your meals – always start with protein and vegetables. This is one of the best habits you can adopt for a better body composition. Besides protein reducing hunger and being calorically costly for the body to digest, its helps to maintain lean body tissue so that you burn more calories daily. Get into the habit of cooking your meals at home. If you have a busy week ahead, pre-plan this by cooking batches of meals and either putting them in the fridge or freezer ready for later. Take control of your situation and don’t let yourself be caught up in the whirlwind of the obesogenic social culture. A 2012 study found that the 3 best habits for fat loss were keeping food journals, not skipping meals, and not eating out. These three things all require action. Taking responsibility and putting it into action is a healthy strategy to adopt. Take responsibility for your actions and you are less likely to feel guilty. Feeling guilty will only stimulate a stress response which will only stimulate the cravings for unhealthy foods. Don’t let a lapse become a collapse. Pick yourself up straight away and own your choices again. 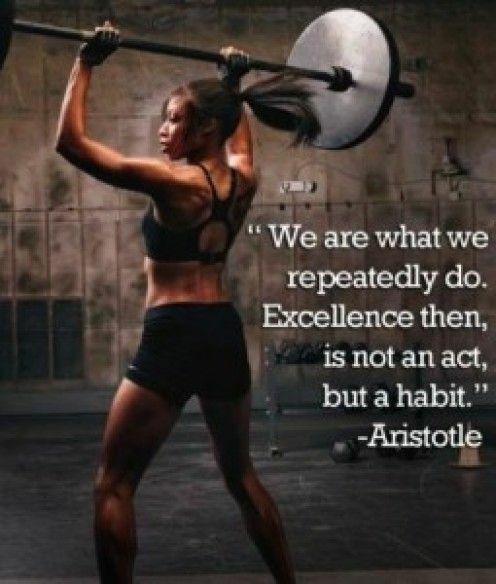 No Comments to "Healthy Habits – Excellence Is A Habit"